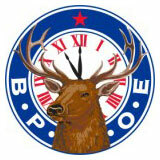 It is really quite simple to reinstate your membership in the Elks! Go back to your old Lodge and ask the Secretary for an Application for Reinstatement. Fill out the form. Pay the prescribed fees. Your application will be forwarded to the Investigating Committee, who will contact you for an interview. After the interview, the committee will make their recommendation to the members at a regular meeting. After the Lodge vote, you will be notified by the Secretary. You will be required to pay a prorated portion of annual Lodge dues. Then you will be issued your membership card. Should you wish to reinstate your membership in Elkdom with a Lodge other than the one in which you were initiated, you must reside in the jurisdiction of that Lodge. Before you reinstate you have to obtain a Certificate of Release from your old Lodge. Write a check payable to the old Lodge in the amount of $10 and ask the Lodge Secretary to forward a Certificate of Release. When you receive your Certificate of Release present it to the Secretary of the Lodge you want to reinstate your membership with. Then you would go through the steps described earlier. If you cannot provide proof of prior membership, it will be necessary to apply for membership as a new member.